When the bombshell hits you – that you and your partner are separating – you might feel a whole tangle of emotions: upset, anger, hurt, bitterness and bewilderment to name but a few. It’s hardly surprising, then, that people who find themselves in this situation often spare little thought for their legal rights. Within a very short time, however, you may be involved in several legal battles so it is important that you know where you stand from the outset. As you probably know, all parents have a legal responsibility to support their children, regardless of whether they live with them or not. If as a father you were married to the mother of your child or children when they were born, you will automatically have parental responsibility. It can get complicated if a father is not married to the mother. If your name is on the child’s birth certificate, you will have parental responsibility. If it is not, then you will need the mother’s consent to have your name added to the birth certificate. You can only do this if there is no other father already named on the birth certificate. In the last instance you may apply to court to get an order stating that you have parental responsibility – whether the mother consents to this or not. Living apart from your children does not negate the fact that you have parental responsibility for your child. You are still able to have a say as to how your child is brought up, although the day-to-day decisions are made by the parent who lives with your child. You may wish to discuss major events in your child’s life with your partner, such as religion or culture, where they go to school, who needs to be consulted about health and medical treatments, where your child will spend their holidays and what would happen to your child if one of you became to ill too look after them. Each of these options is dealt with in detail elsewhere on this website. If you do not have a will, now is the time to make one. If you don’t, then all of your assets, money and other possessions will be dealt with by way of the laws of intestacy in the event of your death. In practical terms, your assets may be distributed otherwise than in accordance with your wishes. If you do have a will, you may want to revise it now that you and your partner are splitting up. It is also important to consider appointing a guardian for your child in your will, in the event of your death. If you are the person with parental responsibility, this may be of particular significance to you. Separation for five years or more, in which case you do not need your partner’s consent. Things can get complicated if the property is in only one person’s name, but both parents have contributed to the upkeep of the property, or the mortgage or other household commitments like childcare. If this is you, you must speak to a solicitor before you move out as things can get very complicated legally if you don’t. If you and your ex-partner lived together but weren’t married, the court generally applies principles to your possessions. If you paid for something, you own it, unless it was given to your ex-partner as a gift. If you bought something as a couple and paid equal shares, you own the item equally. If you bought something out of both of your money, but it is not possible to say who paid what, you both own the item equally. You may be entitled to legal aid to help you with the costs of your separation, divorce or other family proceedings. People on income support, Job Seeker’s Allowance, Employment and Support Allowance or Guaranteed Pension Credit are automatically entitled to legal aid. You may also be eligible if you have savings or assets that are worth less than £8000, and your pre-tax earnings each month are less than £2,657. For more advice, contact a solicitor. I have four children with my wife. We live together but I do work away. She has recently contacted Child Maintenance telling them I have moved my address and that we are no longer living together couples, which is untrue. We still share table and the bed. Children Maintenance Service contacted asking me to make payment to my wife. I wrote a letter to CMS in Feb/2018 disputing the claim. I have not had any response despite many telephone calls. Through telephone conversation CMS demanded for evidence of me living in the same address. I provided my bank statement and medical card. Recently, she has swore affivavit to changed her maiden name to be my surname. I have forward this evidence to CMS. But CMS went head to do attachment of earning forcefully taken money from salary. Recently she has informed that she pregnant with me. I have told her I don't the baby but she said she wants to keep it. I told CMS. CMS are supporting her claim and money is deducted from my salary month. She not used for full benefit of the children. I paid rent, buy food stuff and other needs for the house. I made to complaint to CMS. They have not responded to my complaint. I feel i have not been treated fairly in this case. This is affecting my performance at work and have decided to stop work. I have had couple of accidents recently due this problem. What should I do? The link here may help answer your question. If your partner is the sole owner, you may have no rights to remain in the home if you are asked to leave. However, if you have children, you can ask a court to transfer the property into your name. The court will only do this if it decides it is in the best interests of your children. It is usually done for a limited period, for example, until your youngest child is 18 years old. You will also be able to claim child maintenance for your children. It is worth you paying for some professional legal advice in the first instance, or Citizens Advice can help. I am married but my wife now wants a divorce. She has an 8 year old son who’ll for the past 5 years I have supported financially. My wife does not work. We also have a 2 year old daughter and she is pregnant again. She is now claiming my daughter and the unborn baby are now biologically my children. I don’t know if she is doing this out of spite to hurt me or whether she’s been lying to me just to have access to my moneys etc. She now wants me out the house and wishes I was dead. She also says she will move over 4 hours a way to be with her parents. If my daughter is mine and the unborn baby is mine where do I stand in terms of seeing them and also preventing them moving so far away? If neither are my child what options do I have? If you feel your children are someone else's and not yours, you can request your wife gets a DNA test as proof, please see link here . If the children are yours, please see link here, which shows you what options you have. Goodday, I need assistance please asap. I need advise URGENTLY! My ex fiance and I broke up a few months ago I have 2 daughters which one is his. We lived together 4 years where I supported him and looked after him while he completed his trade. Our daughter is turning 3years old. We were basically forced to leave after mental and physical abuse. were I have been trying to get back onto my feet and support my children. I have the car which is payed off but on his name but him himself has a bakkie aswell. He now wants to take the car away from me a second time which leaves myself and kids without transport. Ive asked that he be considerate as my kids need to get to school ect. Until im able to get a vehicle of my own. After supporting and caring for him for years ive been left with nothing. I want to know please how I can handle this matter and my rights and what I need to do. My ex-partner of 14 yrs (never married) moved out in Jan 19. We're not married and there is not formal custody agreement in place. He's moved into a commercial unit (has a double room and desk space, with shared kitchen and bathroom) which he shares with 4 other adults (who I've only met once or twice). The premisses only have commercial planning permission and I am concerned that this makes them automatically unsuitable for children to live there full time.Is there a way I can find out whether this is a reasonable request from my partner and that is ok for my children to move into that property to live 50% of the time? I'd really like to clarify this before I can move on with custody negotiation with my partner. Also, would the local authority (council?) rule on this? or is there a different body I should approach for advice on this matter? Many thanks! If your child's father is registered on the birth certificate, then he still has parental responsibility, please see link here. If you wish to apply to have PR removed, then you would have to go to court. However, there is no guarantee a court will remove PR, it has to have good reason to consider it. You may wish to take further legal advice if you wish to see whether you have a case. Hi, last year my wife of 15 years cheated on me for the 3rd time in 4 years but this time left the family home leaving myself and 3 boys.The 1st few months of the separation the boys were crushed and seldomly what to spend time with there mother. I work full time but managed with understanding grandparents and employer to get by.Now when my ex wife and I were together a lot of debt was accrued so I've had that to deal with as well but this has impacted our way of living drastically so I've taken the decision to sell the family home.After a few months after the separation Nd a lot of discussion with my children especially the oldest the boys started to stay with there mother again and we agreed 50/50 dual responsibility. One week id have them Friday to Monday then Friday to Tuesday and the boys settled onto this routine.Then my ex occasionally started dropping the boys off on a Thursday until recently it was never a problem because of have my boys every minute of every day if I could but recently I'd made plans on a Thursday not expecting the boys that night then my ex rang saying the boys wanted to stay to which I refused.All hell broke loose and unknown to myself my ex contacted the CSA and basically lied about the care plan we have in place.There demanding I pay 1/5 of my annual salary to which my property will be repossed of I don't sell up in time but what's more infuriating is I'm still having custody of my children more than there mother.I've always had an extremely strong bond with my boys and they've been through tough times this past year but after contacting child maintenance I'm feeling very deflated and concerned with the lack of rights a loving father has as the maintenance team have more or less taken the word of my boys mother. If you were in receipt of child benefit (when you had residency of your children), then you would have a case. The person who is in receipt of child benefit is generally considered the primary carer of your children. Your only recourse would be to challenge your ex's claim in court. Likewise, if you had shared-care to date (and your ex received child benefit) then the court can order that shared-care remains in place and in which case not child maintenance would be paid. However, as in all cases, the court’s main concern is the welfare of the children in question. The court will always put the children’s best interests first and this main issue will determine the outcome of any application for an order. If you cannot afford legal representation in court, you can self-litigate, please see link here . Our Separated Dads forum can help with extra advice if needed and you may also wish to seek professional legal advice. Hi, last year my wife of 15 years cheated on me for the 3rd time in 4 years but this time left the family home leaving myself and 3 boys. The 1st few months of the separation the boys were crushed and seldomly what to spend time with there mother. I work full time but managed with understanding grandparents and employer to get by. Now when my ex wife and I were together a lot of debt was accrued so I've had that to deal with as well but this has impacted our way of living drastically so I've taken the decision to sell the family home. After a few months after the separation Nd a lot of discussion with my children especially the oldest the boys started to stay with there mother again and we agreed 50/50 dual responsibility. One weekid have them Friday to Monday then Friday to Tuesday and the boys settled onto this routine. Then my ex occasionally started dropping the boys off on a Thursday until recently it was never a problem because of have my boys every minute of every day if I could but recently I'd made plans on a Thursday not expecting the boys that night then my ex rang saying the boys wanted to stay to which I refused. All hell broke loose and unknown to myself my ex contacted the CSA and basically lied about the care plan we have in place. There demanding I pay 1/5 of my annual salary to which my property will be repossed of I don't sell up in time but what's more infuriating is I'm still having custody of my children more than there mother. I've always had an extremely strong bond with my boys and they've been through tough times this past year but after contacting child maintenance I'm feeling very deflated and concerned with the lack of rights a loving father has as the maintenance team have more or less taken the word of my boys mother. Much depends upon whether there is a court/contact order in place. If there is, then you will breach the order if you keep the children at home without the other parent's consent. Otherwise, it is negotiable between you. If you are unhappy with the current arrangement and you cannot agree between you, then mediation may be an option for you to consider, in order to try to resolve the situation via a third person. Please see link here. Hi i need advice, i left my husband 2 months after i born our son for domestic violence.. but no proof from police, no doctors, just from HEAT Proof about it. We are still merried, we Are not living more than 2 years together and i want divoce, my husband see my son niw 1xper week...And from his 1 Year started pay maintance. I am on benefits. And where can i get advice with divorce coz it coast 550£ and i cant pay it. Thank you. Hi my ex and I have been separated for approx 5 years. My son is 11. My ex and I agreed not to go through CSA, so he pays matience monthly into my bank. Now after all these years he has been causing trouble....he is buying extra presents for my son etcso now my son wants to go and live with him...I have reluctantly agreed to a trial.my ex is now asking for half of this month's maintenance back because of this. I'm reluctant to give him any because I always pay my bills at the beginning of the month and other things my son may need. Do I have to pay this money back...he keeps harrising me sending messages to pay him. If you are unhappy with your access arrangements mutual discussion is always the best way to try to resolve issues. 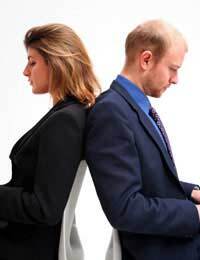 If you cannot resolve them between you, then you should suggest mediation to your ex. Insisting you want a better relationship with your son is not out of order, if you couch it in such a way that it doesn't lead to an inflammatory situation. You can rationally say you will take the matter to court if the situation doesn't improve and if she won't attend mediation. If you cannot afford the hefty legal fees of hiring a solicitor, you can self-litigate, please see link here. Many fathers do this now with good success. Litigants in person must be treated equally before the law and have equal access to justice. Judges have a duty to ensure a fair trial by giving them due assistance to achieve this. The courts also do want fathers to have a good relationship with their children. If you are on a low income, you may also get help with court costs, please see link here. However, court is always seen as a last resort and trying to resolve this amicably between you is always the preffered approach. There are no laws to say his ex can or cannot make these requests. But if the child's mother is struggling financially and cannot afford to feed her children, then quite naturally one person she is going to ask for help will be the children's father. This is an issue they would really have to sort out between them while keeping the best interests of the children in mind. Hi, I have a 3yrs old daughter and i and her mum have been separated since she was 18months she moved to another environment different from where we used to stay together . I tried to beg her to stay, I spoke to my ex 'a dad and sisters to talk to her but she refused after 1yrs I meet another lady who adored me. We started living together and this lady has a baby but am not the father. Immediately my ex heard I have another relationship she begged to come back but I refused cos it was too late for me to take her back. Ever since I pay child support or child maintancar every month ( I set a direct debit on my acct) and I go see my daughter every month because where my ex stays is 3 hrs drive form my place. Have been trying to make my daughter come spend weekend with my every now and then but my ex refuse I can only go see her and come back to my house that same day but I need to spend more time with her but my ex refuse. Pls what can I do and what am I right? I split from my ex before my son was born in march of this year. I pay maintenance even tho she refused to put my name on the birth certificate and refuses to let me see him. She an alcoholic who has lost her license for drink driving and has been arrested on another occasion for drink related offence, social services are involved with her as well now so my question is, do I have to pay maintenance if there's a very good chance the money or at least part of it is going on alcohol? Can I not open a separate account for My son and put the money in there? I'm afraid not. Every non-resident parent is legally responsible for paying the resident parent towards the financial upkeep of their child. This is regardless of whether the paying parent approves of what the non-paying parent spends the money on. Unless your ex agrees to the specific family-based arrangement you are suggesting, then you would have to continue to pay her directly. I'm afraid there is no clear answer to your question, you would have to seek legal advice. Much also depends upon the age of your daughter and whether she is under 18. Please see CAB link here which should help answer your question further. Your husband is going through a very tough time currently and obviously it will be upsetting if he is removed from his children. You say 'my' children in your comment, but your children are both yours and your husband and each has the right to see your children when each chooses, meaning he has equal rights and responsibilities governing the care of your children. If both parents have Parental Responsibility and one parent is keeping the children against the other's wishes, the police cannot help, even if the children do not normally live with them. It is very rare this happens, but if you are genuinely concerned then you would have to take the matter to court in order to apply for a residency order, which is usually considered by the courts when the resident parent is in fear of the non-resident parent taking the children and keeping them without consent. It's a tricky situation, as from what you say, you are separated because of illness and not choice. I can only suggest you try to communicate with your husband directly, as putting barriers up and telling your husband what he is not allowed to do regarding both of your children will invariably create friction. Being supportive and thinking of ways around the situation may help you to get through this tough time, but keeping him away from the kids is going to cause anguish all round. Speaking to his mum and trying to negotiate a way forward mutually, as a family should also help. However, if you feel the situation is untenable, then please see gov.uk link here .